(CNN) -- A Continental Airlines jetliner flew with one engine powered by a mix of oils from algae and jatropha plants Wednesday in what the plane's manufacturer called an "outstanding" test flight. 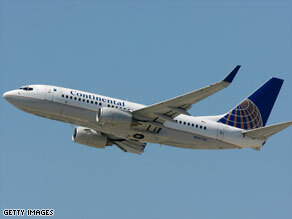 Continental Airlines is the third commercial carrier to test biofuels in their planes. The Boeing 737 burned less fuel in the biofuel-powered engine than a conventionally powered engine, and the two performed identically during the one-hour, 40-minute flight, Boeing spokesman Terrance Scott said. "There was no hesitation at all," Scott said. "If you had to grade it on a scale of one to 10, it would be an 11." Wednesday's test, conducted from Continental's hub in Houston, Texas, was the first by a U.S. carrier and the first to use a blend of oils from algae and the jatropha, Scott said. One engine ran on a 50-50 mix of that combination with conventional jet fuel, while the other ran entirely on conventional fuel. The 737 is one of the most common aircraft in service in U.S. markets. A crew of two pilots and an engineer put the jet through a series of exercises, including measuring the biofuel's response to the cold of a 38,000-foot cruising altitude and stopping and restarting the engines in mid-flight, Scott said. Biofuels: Solution or new problem? Britain's Virgin Atlantic Airways flew a much larger Boeing 747 on a test flight last February using a mix of coconut and babassu oil in one of the plane's four main fuel tanks. And last month, Air New Zealand tested a 747 with one of its engines powered by a blend of conventional jet fuel and jatropha oil. "What we're starting to see here is even when you combine two of them that haven't been flown before, the performance is equal to or better than traditional jet fuel with no degradation," Scott said. He said work on the fuels has been going on for about three years, and biofuel blends could start going into service in three to five years. In a statement announcing the flight, Continental said it would examine the engines to make sure the fuel had "substantively no different" effect on them.